On Monday, February 12, more than 150 distinguished guests and journalists had the opportunity to attend the official opening of the Simulated Trading Room (STR), first of its kind in Southeastern Europe. Among the attendees were government officials, prominent professionals from the world of business and finance, as well as distinguished individuals from the ACG community. Guests gathered at the Deree Student Lounge where honorary speakers U.S. Ambassador to the Hellenic Republic, Mr. Geoffrey R. Pyatt, President David Horner, and Dean of the School of Business, Dr. Annie Triantafillou discussed the benefits that the STR offers to ACG students. President Horner addressed the opening remarks and stated “Our goal is to channel resources into Greece to make a difference and STR is one of our prime steps into achieving it,” before introducing the U.S. Ambassador to the audience. “The trading room will serve as a laboratory and classroom providing a unique experience to students that they can use when they begin searching for jobs in financial services or banking” said Ambassador Pyatt for the opportunities students will receive through the STR, a project funded by USAID and supported by the National Bank of Greece. The Simulated Trading Room replicates a real-world trading experience providing students with unique hands-on training in Greece, a competitive edge in the domestic and international job market in challenging times. 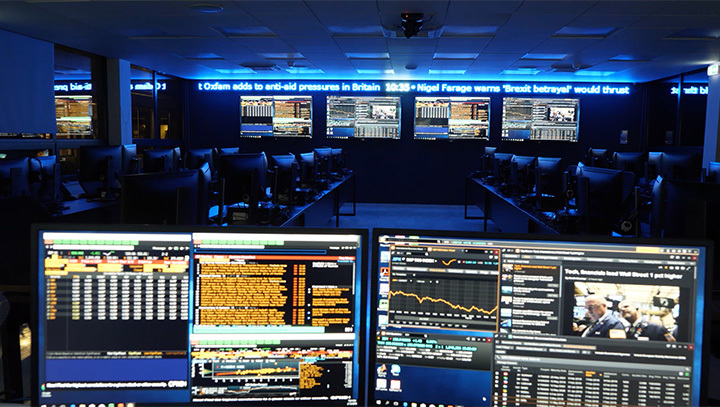 The STR includes some of the latest and most established software and equipment found in trading floors around the world, making financial markets easily accessible by ACG students and graduates. Dean Triantafillou referred to the road-so-far and to the process of bringing an educational dream to life, before inviting guests to an up-and-close look into the STR and its capabilities. The event was covered by multiple media channels, including an Ant1 TV special. The ceremony was coordinated and organized by the ACG Marketing and Communication Office.